Template typesetting involves taking the content that you've already written or generated and placing it inside a LaTeX template of your choosing. Your content may be in any digital format: a Word document, PDF, text file, image file, table, etc. The template used can be a publicly available template from LaTeXTemplates.com, your own template or one we have created for you. The output of this service is the compiled PDF with your content but you will also receive the files required to compile it yourself and make modifications in the future. 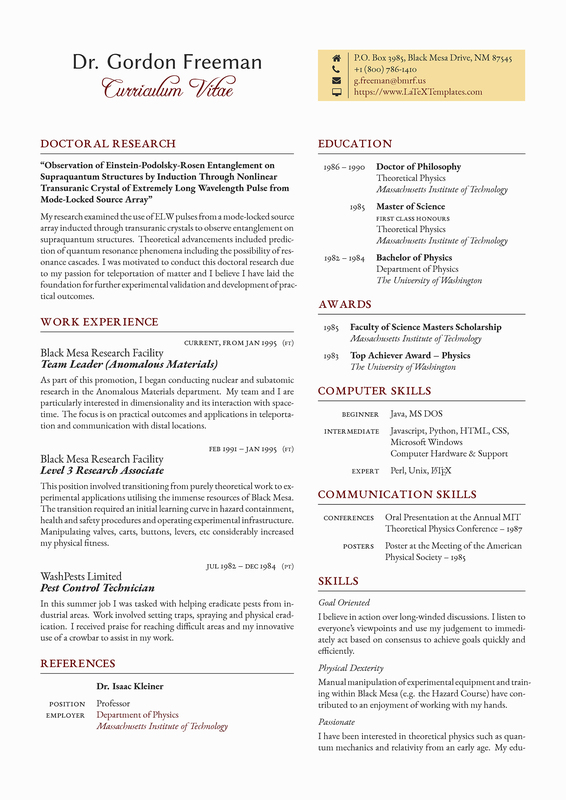 An example application of this service is to typeset your CV/Résumé from Word to a LaTeX template to make it look more professional and stand out from the crowd. See an example of this improvement on the Showcase page. This service is suited to those who like the look and technical strengths of LaTeX but do not have the desire or time to learn and/or operate LaTeX. We can also help you automate your existing processes such as populating a LaTeX template with data you have generated or written in an incompatible format.